Woah! 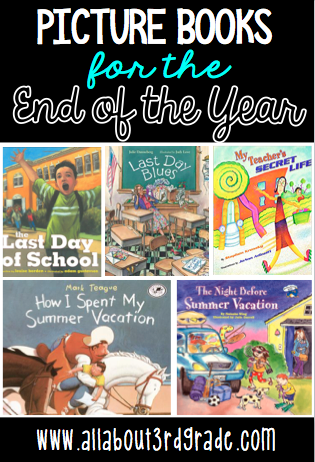 Can you believe it's the end of the school year already? Hallelujah! The end of the year is super hectic, but I always liked to make time for some good books to close out the year. The stress is over and now we can read- just for fun- a little more often in class! This 3rd grader is super excited about the last day of school and a special gift he wants to give his teacher. I love reading The First Day Jitters on the first day of school and this one is super cute for the end of the year. This one isn't really about the end of the year, but I love how it's from the perspective of a student that truly things their teacher lives at school and is so shocked seeing her out and about in her "real life". It's cute and fun! 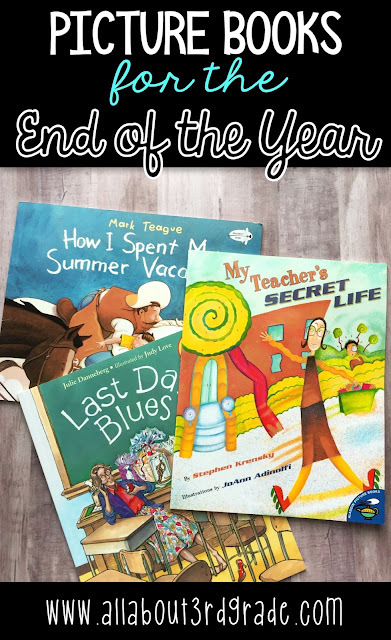 This one is great for the beginning of the year or the end of the year! This has a fun rhyme and tells the "out there" story that one kid wrote about what he did on summer vacation. You could easily expand this book into a fun writing lesson. I love "The Night Before" books for any special day and I have a ton of these (a lot by Natasha Wing). This is a fun and easy read aloud that your kiddos will enjoy.